While your oral health might be in good condition, you may still see things you'd like to change when you smile in the mirror. Maybe your teeth are slightly crooked or discolored. Maybe you have a chipped tooth or a gap in your smile. If you're lucky, we can correct the problem with one simple cosmetic dentistry procedure. But for many of us, there are multiple improvements we'd like to see in the mirror. That's why at Newman Family Dentistry we offer a complete smile makeover - a treatment plan to address your entire smile wish list. How Will Your Smile Makeover Proceed? Patients who are considering a smile makeover are invited to one of our Indianapolis area offices to discuss their concerns about their smile. One of our experienced cosmetic dentists will listen to your concerns and then assess the specific dentistry work you might need through an oral examination. From that point, you and your dentist will tailor a smile makeover to meet your own unique needs. You can choose treatment options based on initial cost, longevity of the work, how long the treatment will take, or how many visits. If you need to replace a missing tooth, for example, a dental implant is typically the best choice for aesthetics, longevity, and function, but it could take months to complete. A bridge may not last as long, but it can be done quickly and inexpensively. Once you determine the procedures you want to have done, you'll work out a schedule for each to maximize the benefit, spread out the expense, or complete the work that has the most immediate benefits first. For example, if you plan to have teeth whitening and Invisalign, you may choose to have the teeth whitening done first since it can be completed in a single visit. If you're unhappy with any aspect of your smile, the total smile makeover process might be right for you. The first step is to schedule a consultation with one of our talented cosmetic dentists. 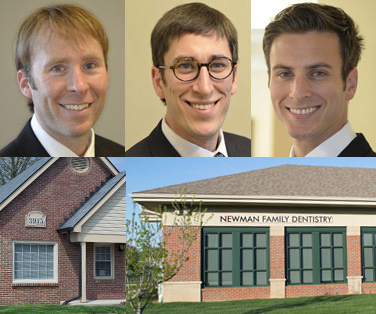 Newman Family Dentistry strives to provide the best dental care available to our patients in Indiana from our two office locations in Indianapolis and Carmel. We look forward to meeting you and getting started giving you a smile you'll love to see in the mirror.